Neighbors Plus is a 501(c)3 not-for-profit organization that is financially supported by the generosity of Harderwyk members and the Holland community. Gifts of time, talent, and money are all important to Neighbors Plus. In 2017-18, there were 295 volunteers, 1254 program participants, 7 staff leaders, and 3 AmeriCorp volunteers. ​Please click here to see our Annual Report for fiscal year 2017-18. Email Jennifer and Donate to Neighbors Plus today! In addition to the annual fundraising events, Neighbors Plus sells delicious soup mixes for your winter suppers. Try one of the yummy mixes and support Neighbors Plus. They are great holiday and hostess gifts for people with everything! 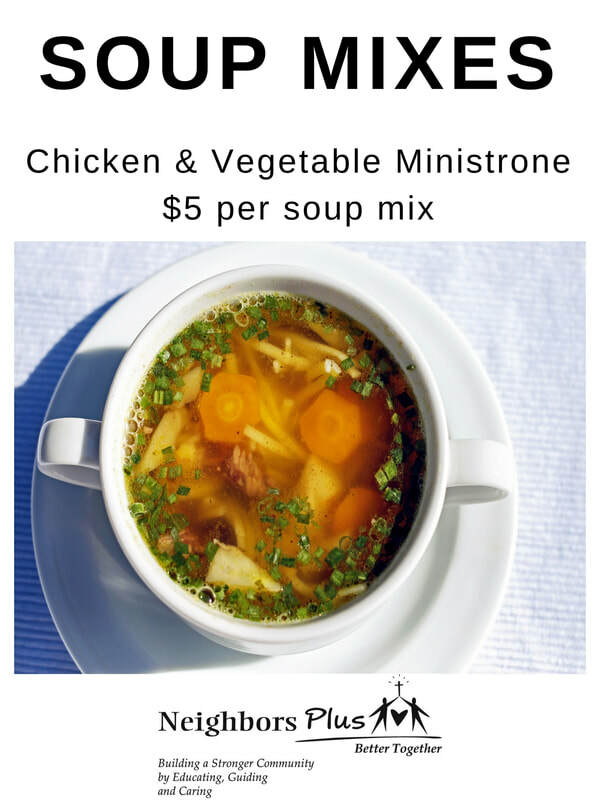 Available from November 1 until supplies last (you can find soup mixes in the Harderwyk Ministries church office).